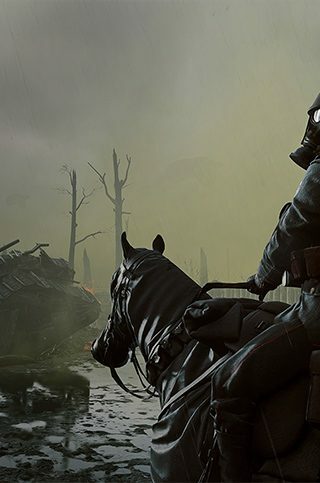 The focus of Stage 3 is devastation — captured across five maps in the Battlefield 1 Apocalypse expansion, based on the Great War’s most brutal battles. The once quiet and peaceful village of Passchendaele has been pulverized by weapons designed to end the war swiftly. The infantry-focused Passchendaele map provides cover and trench networks, ruined houses, and abundant shell craters. Similarly, the once thriving wheat fields of Somme have been cooked to ash by a storm of steel. Embark on open warfare on the River Somme map with clear trench line battles of man versus machine. * THIS OFFER IS BEING ISSUED TO YOU FOR PROMOTIONAL PURPOSES ONLY AND DOES NOT HAVE A CASH VALUE. OFFER EXPIRES AUGUST 7, 2018. VALID FOR NEW DOWNLOADS OF BATTLEFIELD 1 APOCALYPSE, BATTLEFIELD 4 NAVAL STRIKE AND BATTLEFIELD 4 CHINA RISING (EACH, A "PRODUCT") ONLY FROM THE ORIGIN STORE (origin.com), WITHIN THE ORIGIN CLIENT SOFTWARE (origin.com/about), FROM THE PLAYSTATION STORE, OR FROM XBOX MARKETPLACE. BATTLEFIELD 1 FOR APPLICABLE PLATFORM (SOLD SEPARATELY) REQUIRED FOR BATTLEFIELD 1 APOCALYPSE OFFER. BATTLEFIELD 4 FOR APPLICABLE PLATFORM (SOLD SEPARATELY) REQUIRED FOR BATTLEFIELD 4 NAVAL STRIKE OFFER AND BATTLEFIELD 4 CHINA RISING OFFER. YOU MUST LOG INTO BATTLEFIELD 4, BATTLEFIELD 1 OR BATTLEFIELD V WITH THE SAME EA ACCOUNT USED TO EARN AWARDS. FOR PLAYSTATION 4, A PLAYSTATION PLUS ACCOUNT (SOLD SEPARATELY) MAY BE REQUIRED IN SOME LOCATIONS. VALID WHEREVER PRODUCT IS SOLD. LIMIT ONE OFFER PER PERSON. MAY NOT BE COMBINED WITH ANY OTHER PROMOTIONAL OR DISCOUNT OFFER, UNLESS EXPRESSLY AUTHORIZED BY EA; MAY NOT BE COMBINED WITH ANY PREPAID CARD REDEEMABLE FOR THE APPLICABLE CONTENT. CUSTOMERS ARE RESPONSIBLE FOR APPLICABLE SALES TAX. OFFER MAY NOT BE SUBSTITUTED, EXCHANGED, SOLD OR REDEEMED FOR CASH OR OTHER GOODS OR SERVICES. VOID WHERE PROHIBITED, TAXED OR RESTRICTED BY LAW.